IronSocket VPN Review | Is this VPN any Good? Complicated setup and lack of live support hold IronSocket back from its potential. IronSocket originally got its start in the world of anonymous browsing back in 2005 when the company launched HideMyNet.com. HideMyNet was a proxy service used to bypass online censors. In 2013, the company went through an overhaul, adding a more robust VPN service among other enhancements. It is not, however, as robust as most of its competitors in the VPN space. Most notably, IronSocket lacks its own VPN client, instead relying on the open-source OpenVPN Connect app. This makes setting up IronSocket much more difficult than most VPN providers out there, and we’ll talk more on that later. A single service tier is available with discounted pricing for six-month and one-year subscriptions. The service costs $6.99 (GBP 4.89) for a single month, $35.95 (GBP 25.17) for six months, and $49.95 (GBP 34.98) for a year. That yearly price comes out to $4.16 (GBP 2.91) per month, which is fairly competitive. A 7-day money-back guarantee is available. For those who wish to remain as anonymous as possible, they can pay with bitcoin or even an unused gift card, such as from Starbucks or Walmart. IronSocket allows customers to connect up to three devices at a time. The recommended way to connect is through OpenVPN, but configurations for L2TP and PPTP are available as well. On top of the usual Windows, Mac, Android, and iOS devices, IronSocket works a wide range of internet routers, all major gaming consoles, smart TVs, and set-top boxes. Bandwidth is unlimited. In addition to the VPN service, an IronSocket subscription comes with a Smart DNS proxy and an HTTP/SOCKS5 proxy. The HTTPS and SOCKS5 proxies are sort of like lightweight VPNs minus the encryption. More interesting is the inclusion of the Smart DNS proxy. Why? Because Netflix and some other streaming video sites recently began blocking VPN users from accessing shows they couldn’t normally view in their home countries due to licensing restrictions. VPNs were a popular means of evading the Netflix geo-restrictions and accessing Netflix’s larger US and UK catalogs of shows. Netflix has put a stop to VPN users for now, but IronSocket’s Smart DNS still allowed me to watch shows otherwise not available from where I live in Bogota, Colombia. These included Attack on Titan and Parks and Recreation. 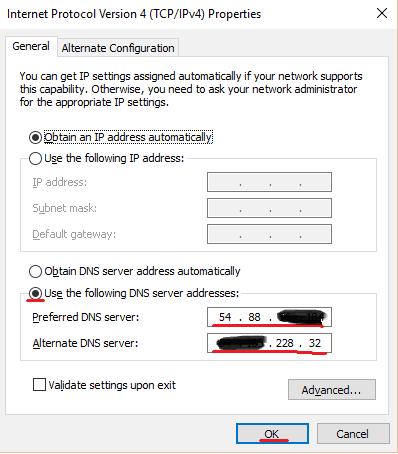 A Smart DNS proxy should in theory be faster than using a VPN because it does not encrypt your connection, nor does it mask your IP address. It requires a bit of setup, and the IronSocket website could use a more straightforward tutorial, but I got it up and running in less than 20 minutes. Note that Smart DNS should not be used in lieu of a VPN when security or privacy is a concern, but it’s a great alternative for accessing geo-locked content that can’t be viewed with a VPN. Because IronSocket lacks its own native client, it lacks several features we’ve come to love on competitors. It has no kill switch for when the connection drops, no DNS leak protection, and no tweaking any of the security settings, among other oversights. As we mentioned above, this is IronSocket’s biggest failing. Whereas most VPN providers have their own custom VPN software, IronSocket suggests customers use the open-source OpenVPN Connect app. Essentially, IronSocket provides the servers, but not the software. The OpenVPN app requires a far more tedious setup process than most rival VPN clients on the market. Perhaps the biggest frustration is the fact that the user must download and import an individual configuration file for every server they want to connect to. The server list isn’t readily available on the OpenVPN client. We downloaded three–Miami, Dallas, and London–for testing purposes. Unless you’re an experienced OpenVPN user, this process will require you to reference a tutorial on IronSocket’s website. Depending on which version of OpenVPN you use, the step-by-step instructions could well deviate from what you see in practice. Suffice to say, the setup process could easily intimidate novice users. 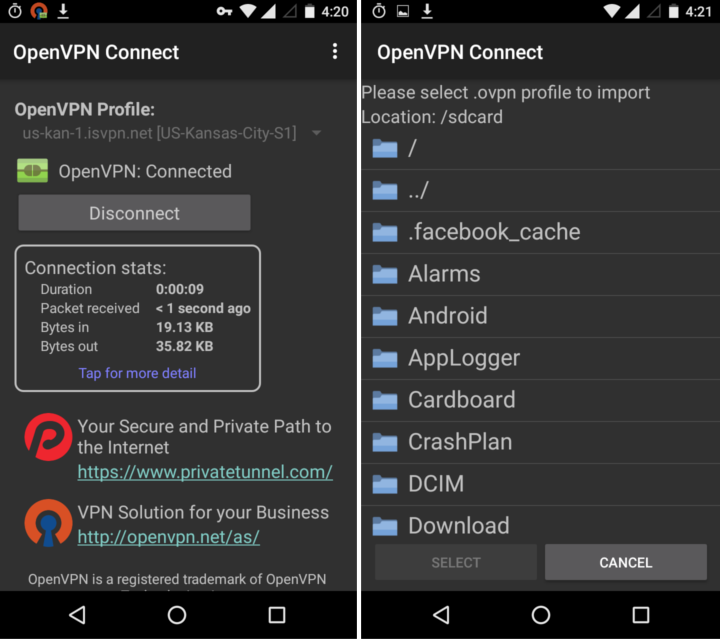 It’s the same story on mobile devices: users must download and install the OpenVPN Connect app and download/import each server’s config file manually. The config files don’t sync between devices, so you must add them separately for each device. If you want to use a lot of devices, this gets tedious quickly. Once you’ve installed OpenVPN and added all the config files you need, connecting is fairly straightforward. The OpenVPN Connect app runs from your system tray. Just right click, select the server you want, and type in your credentials. 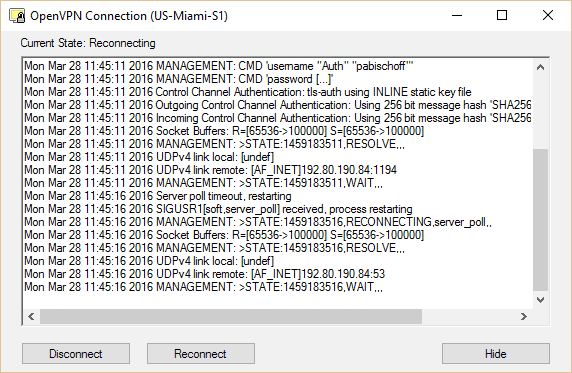 Should something go wrong, however, it can be difficult to pinpoint the source unless you have experience reading the real-time connection log. When I typed in the incorrect username and password (which you must manually change from the assigned credentials after opening an account), I never received an “incorrect username or password” message. Instead, OpenVPN just tried to reconnect endlessly until I turned it off. IronSocket’s servers span 36 countries, with nearly a dozen locations in the US alone. That’s a fairly middle-of-the-road selection when stacked up against competitors. Getting connected can be spotty at times–don’t expect 100 percent uptime on all servers–so having a backup config for a second server on hand is a good idea. Once connected, IronSocket stays connected. We didn’t have to worry about downloads or streams being interrupted due to a connection dropping out. We had no issues streaming HD video or playing Brawlhalla online (a Super Smash Bros-style fighting game). We experienced no buffering or lag in either. For a more empirical speed test, we downloaded the same 82.7MB file (compressed from 103MB) three times on three different servers at three different times per day for a total of nine tests. We performed three additional tests without a VPN as a control group. 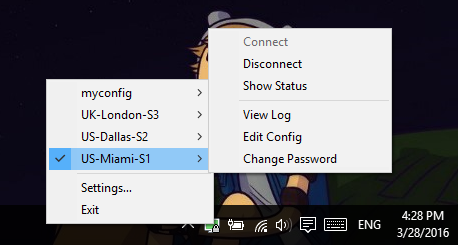 I connected to servers in Florida and Texas in the US, which are geographically closest to me, and in London. In the boxplot below, the thick black line represents the median download time, while the red diamond represents the mean. We included our previous tests of ExpressVPN and Private Internet Access for comparison. Lower is better. Even though IronSocket was fast enough to game and watch video on, it significantly slowed download speeds across the board and was markedly slower than the two competitors we tested at an earlier date. Not only was it slower than those two rivals, download speeds were also far more volatile as shown by the size of the blue rectangle. Keep in mind that this test is not a definitive indicator of which VPN is fastest. The internet’s inherent volatility adds a significant factor of randomness, so VPN speed tests should always be taken with a big grain of salt. My original location is in Bogota, Colombia, where I run these tests on a 10 Mbps connection. Those with faster connections may well notice a larger discrepancy in speeds. Each time the user downloads a configuration file for a server location on IronSocket’s website, they will be asked to choose between three encryption tiers: strong, light, or none. Strong, the recommended default configuration and what was used in our speed tests, uses AES 256-bit encryption. Light uses 128-bit Blowfish. None uses no encryption at all, but is the fastest of the bunch. All encryption levels use a 4096-bit key for authentication. IronSocket users are assigned a shared public IP address each time they connect. This makes it more difficult to pinpoint a specific user, adding anonymity. IronSocket does not offer dedicated/static IP addresses, which can be useful for certain purposes such as logging into IP-sensitive websites (static IPs can also be a means of bypassing Netflix’s VPN ban). IronSocket does not track or keep logs on the activity of any of its users. OpenVPN does store logs on the local device for each server, though. Some of IronSocket’s servers are configured to block P2P connections. That means at some level the user’s activity is being monitored, even if it’s not being logged. The server list on the website shows which locations do not allow P2P downloading (see: torrents). Those include all of the servers in the United States and United Kingdom. IronSocket claims it offers 24/7 customer support, but really it’s just a ticket submission system. There’s no live chat or phone number to call. After submitting a ticket late on a Friday afternoon, we received a response within six hours. The answer to a question about IronSocket’s privacy was competent and to the point. With such a complicated setup process–IP authorization, importing config files, troubleshooting problems–a ticket submission system won’t cut it for a lot of customers who just want to plug and play. IronSocket provides a decent library of tutorials to guide users through the process, but the fact that I had to reference three tutorials to get it up and running is testament to just how user-unfriendly IronSocket can be. The FAQs section consists of information about the service, but is little help when it comes to troubleshooting. During my time with IronSocket, I never received an unsolicited email or any other spam from the company. Ads and promotions are kept to a minimum. IronSocket is not a VPN for the novice user. A complicated, tedious setup combined with a total lack of live customer support could easily leave non-tech savvy customers pulling their hair out. For the more advanced crowd, IronSocket is an affordable option with a handful of useful extras on offer, most notably the included Smart DNS service. Security seems solid on the whole, although P2P users should probably steer clear. IronSocket has the potential to put a dent in the VPN market, but it will need to invest in native desktop and mobile clients to make setup easier for the end user.